Over the past year or so we have seen the energy debate reach frenzied proportions with everyone from the Prime Minister, to your best mate that works in marketing deciding that they know which technology is best for providing energy to this country. The fact is, the generation space is a very fast moving entity made up of different parts spread over incomprehensible distances. The short answer is there is no answer. What works in one location may not work in others. There is certainly no magical ‘base load’ station in the sky, nor is there any easy way of distributing the required base load into industrialized spaces. Things went up a notch around October 2016 when South Australia experienced what was a once in a lifetime storm that took out multiple high voltage transmission towers and resulted in blackouts across the entire state. There is much debate as to why this occurred, but it doesn’t take a genius to realize that if you cut the wire, the power goes out. Whilst this was the real cause, it also became apparent that renewables will not stand up on their own without something stable to keep them in sync. In the industry, we call this rate of frequency change, or ROCOF for short. It is ROCOF that caused South Australia’s wind farms to disconnect, and it is ROCOF that we must stabilize on a micro basis if the power grid is to reach 100% renewable capacity. This resulted in a frenzy of negative renewable press stemming mostly from The Australian stating that renewables were causing power costs to rise and also decreasing grid stability. The renewables industry responded by pointing out that we have gas plants on standby which refuse to start during grid events due to regulatory failure. This has all boiled out onto the armchair of most Australian’s to the point that it has become about coal or solar, when really it should be about taking the smartest, and most innovative path towards our energy future. By now, most people have seen the dynamic duo from Sydney with their intriguing IP and a magic little box thats function was initially unknown. 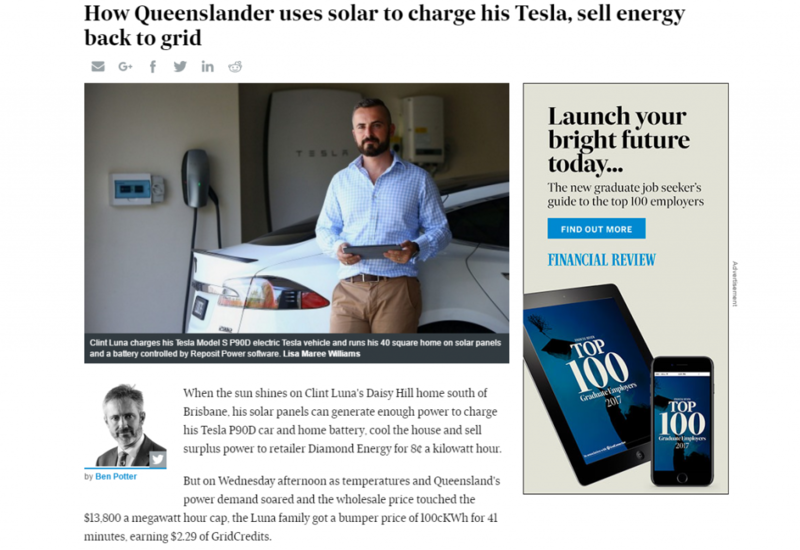 Dean and Lachlan are now at the stage where they have proven their energy optimization algorithm, have an active installation base, and are successfully lobbying – and paying – high-value grid credits. They were the first two people to achieve this in the world – fact. What most people probably dont realize about Reposit is that what IS an excellent investment for any battery system, may also be one of the key components in solving our growing energy crisis. If we roll back a few years and shoot over to Germany, the concept of a smart grid is well established. The idea is that excess energy from one building is fed into another and that smart controls taking care of things like HVAC ramping are used to balance out demand and create a multi-directional micro grid that is all but impervious to interruption, and minimizes the variability that has been associated with renewables. Fast forward to now and this concept is growing, not just in popularity but also in scale. It has become accepted that we can ‘track the sun’ by distributing solar PV across huge distances, all linked by HV DC lines thereby ensuring that late night sun in Perth, is feeding into peak time demand in Melbourne, and that as the sun is beaming in Sydney, it is taking care of Perth’s breakfast requirements. Add a few GW’s of wind over a similar geographical area, and it shouldn’t be hard to understand how, or why ‘peak demand’ could become a thing of the past. So where does Reposit fit into this? In quite a lot of ways actually. Firstly there are numerous benefits to those who install it, but the critical advantage that we see is to the grid itself. You see Reposit is able to call pocket storage on demand, when and where the grid needs it. This not only serves to reduce peak demand, but it can also be used to stabilize ROCOF and therefore reduce the possibility of systems going off line. Reposit is a smart box that sits between your battery and the grid. When the the grid requires additional energy, it puts a call out for additional supply and your home battery is then used to export energy into the grid. You are then paid at peak rates of $1 per kWh (Grid Credits) in direct competition with the big generators such as gas and coal. If you’re standing in your garage looking at a 6kWh lithium battery, it may not sound like much, but when you place thousands of these systems over large geographic distances, it starts to add up. Why Should I Install Reposit? 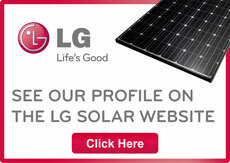 Reposit are the only battery management system that offers Grid Credits period. Whilst this may change over time, Reposit already have a solid installation base, which will enable them to leverage their growing bargaining power with even more attractive offers. Grid Credits are paid during grid events such as heat waves, black outs and other peak demand events and currently deliver $1 per kWh for every unit sold. A Reposit system will utilize predictive weather technology to optimize your battery usage. Lets say that its going to be overcast in the afternoon. Your Reposit box knows not to draw down on your battery in the morning as it knows that it won’t receive full charge later in the day. Many areas of Australia now have Time of Use (ToU) tariff structures available. What this means is that instead of having a single tariff rate, or a two tariff structure (ie peak and off peak), there is a single connection with a tariff rate that varies according to the time of day. Typically this will involve a peak, off-peak and shoulder rate which are timed around periods of heavy grid use. A Reposit system will optimize your battery around ToU structures to ensure that you are only ever drawing from off-peak power. This can dramatically reduce your power bill. Reposit will modify your battery usage to suit your individual load profile. It learns this over time and will adjust accordingly should your patterns change. 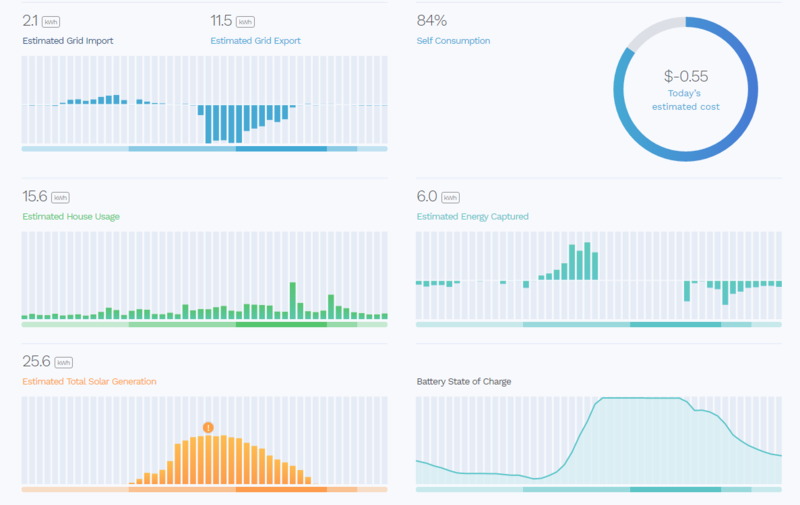 Reposit will monitor your production, consumption, battery usage and grid credits – all in one single, easy to read interface. Like to check your system on the go? No problem, there is an app for that. Yesterday was a good day for anyone interested in batteries. Elon Musk bought an incredible amount of advertising for free. In fact if he swings it the he wants, South Australia will pay him roughly 30M dollars for the privledge. The context of that deal is that Tesla will install 100MW of batteries in 100 days or do it for free. This didn’t really grab my attention though, as that sort of scheduling in the right sort of contract framework is feasible. What caught my eye was the price per kWh. At $250 per kWh the pricing seemed inconceivably cheap. To put this into context, when the SA grid went down it was using about 500WM per hour ie 500MWh. That event lasted some 6 hours which is about 3GWh. How much do you think it would cost to install THREE GIGAWATT HOURS of storage? Before we calculate this, did you know that our government spent 550 MILLION on researching ‘CLEAN COAL’? Surely a battery system of this size would cost 100 thousand billion dollars? 750 million. Yep thats it. We spend more on a bridge. The NBN is 80 of them if not more. Imagine if we could combine that sort of grid investment with grass roots battery management. It wouldnt take twelve transmission towers to take out the entire grid, because the grid would be a self-meshing entity that would withstand any sort of impact. There are many homeowners that already have Reposit installed. It is no uncommon to see a bill reduced to near zero as the Grid Credits allows them to offset their connection charges. If we look at their demonstration system, its overall cost per month is often less than $10 and many days have negative costs. The recent February heatwave say days where the system pulled 30kWh from the grid and yet managed to achieve an impressive average price of 19c per kWh via its optimization algorithms. Since some of these days also attracted Grid Credits, the overall cost for the month was $17.96! This is for a home that would otherwise have a bill of between $800-$1000! Take a look at what Reposit can do for you by utilizing their guest account, or take a look at some Reposit ready packages.